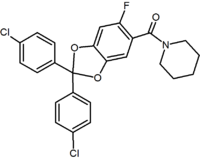 A cannabinoid receptor antagonist, also known simply as a cannabinoid antagonist or as an anticannabinoid, is a type of cannabinoidergic drug that binds to cannabinoid receptors (CBR) and prevents their activation by endocannabinoids. 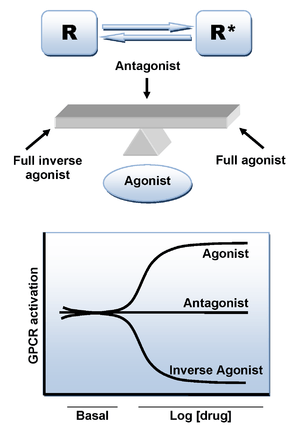 They include antagonists, inverse agonists, and antibodies of CBRs. The discovery of the endocannabinoid system led to the development of CB1 receptor antagonists. 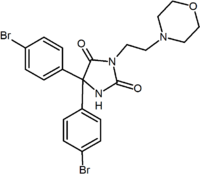 The first CBR antagonist, rimonabant, was described in 1994. Rimonabant blocks the CB1 receptor selectively and has been shown to decrease food intake and regulate body-weight gain. The prevalence of obesity worldwide is increasing dramatically and has a great impact on public health. The lack of efficient and well-tolerated drugs to cure obesity has led to an increased interest in research and development of CBR antagonists. 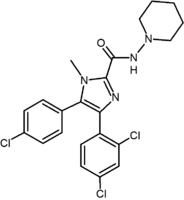 Cannabidiol, a naturally occurring cannabinoid, is a non-competitive CB1/CB2 receptor antagonist. For centuries hashish and marijuana from the Indian hemp Cannabis sativa L. have been used for medicinal and recreational purposes. In 1840, Schlesinger S. was apparently the first investigator to obtain an active extract from the leaves and flowers of hemp. A few years later, in 1848, Decourtive E. described the preparation of an ethanol extract that on evaporation of the solvent gave a dark resin, which he named “cannabin”. 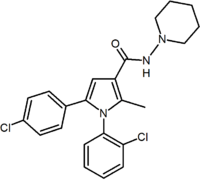 In 1964 the main active constituent of C. sativa L., Δ9-tetrahydrocannabinol (THC), was isolated and synthesized by Mechoulam's laboratory. Two types of cannabinoid receptors, CB1 and CB2, responsible for the effects of THC were discovered and cloned in the early 1990s. Once cannabinoid receptors had been discovered, it became important to establish whether their agonists occur naturally in the body. 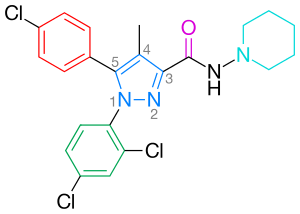 This search led to the discovery of the first endogenous cannabinoid (endocannabinoid), anandamide (arachidonoyl ethanolamide). Later on other endocannabinoids were found, for example 2-AG (2-arachidonoyl glycerol). These findings raised further questions about the pharmacological and physiological role of the cannabinoid system. This revived the research on cannabinoid receptor antagonists which were expected to help answer these questions. The use of the cannabinoid agonist, THC, in its many preparations to enhance appetite is a well known fact. This fact led to the logical extension that blocking of the cannabinoid receptors might be useful in decreasing appetite and food intake. It was then discovered that the blockage of the CB1 receptor represented a new pharmacological target. 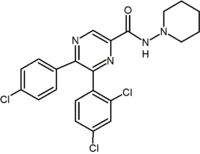 The first specific CB1 receptor antagonist / inverse agonist was rimonabant, discovered in 1994. A number of initiatives have been published to develop CB1 antagonists that target only peripheral CB1 receptors by restricting their ability to cross the blood brain barrier. Among these initiatives 7TM Pharma has reported the development of TM38837. 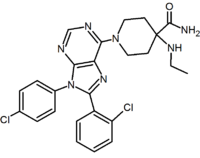 A review has now published on the approaches and compounds being pursued as peripherally restricted CB1 receptor blockers. ↑ Schlesinger S. Untersuchung der Cannabis sativa. Repertorium für die Pharmacie. 1840:190-208. ↑ Decourtive E. Note sur le haschisch. CR Hebd Séances Acad Sci..1848;26:509-510. 1 2 3 4 Mackie K (2006), "Cannabinoid receptors as therapeutic targets" (PDF), Annu. Rev. Pharmacol. 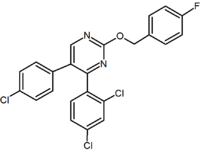 Toxicol., 46: 101–22, doi:10.1146/annurev.pharmtox.46.120604.141254, PMID 16402900. ↑ Fong TM, Heymsfield SB (September 2009), "Cannabinoid-1 receptor inverse agonists: current understanding of mechanism of action and unanswered questions", Int J Obes (Lond), 33 (9): 947–55, doi:10.1038/ijo.2009.132, PMID 19597516. 1 2 3 4 Barchukov, V. V.; Zhavbert, E. S.; Dugina, Yu. L.; Epstein, O. I. (2015). "The Use of Release-Active Antibody-Based Preparations for Vertigo Prevention in Adults". Bulletin of Experimental Biology and Medicine. 160 (1): 61–63. doi:10.1007/s10517-015-3098-z. ISSN 0007-4888. ↑ Chorvat, Robert J. (2013). "Peripherally restricted CB-1 receptor blockers". Bioorg. Med. Chem. Lett. 23: 4751–4760. doi:10.1016/j.bmcl.2013.06.066.